The number of coat colors that pet rabbits can come in is long and sometimes confusing. The following list covers the basic color descriptions or color groups found in pet rabbits. 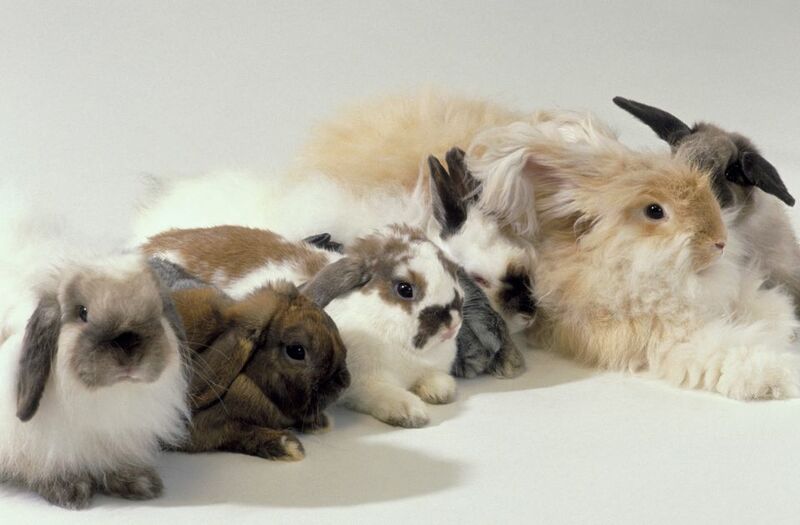 Not all breeds of pet rabbits can come in all of these colors or patterns. Black otter: This pattern includes a black body with a lighter underside, hair may be orange tinted at the border of the black and lighter color. Blue: Medium or slate blue. Blue otter: Blue coat with fawn tipped guard hairs and fawn areas. Blue steel: Blue with silver or tan "ticking." Blue tortoiseshell: Blue and beige. Broken: This pattern can include rabbits that have white fur with any color patches or spots, with nose markings, colored ears, and/or eye circles. Brown-gray agouti: The individual hairs of this color of rabbit are blue at the base (closest to the skin) then medium tan, charcoal, and finally tan at the tip. Californian: White body with black on nose, ears, tail, and feet. Castor: This is a pattern that has brown fur over top, a slate blue undercoat, with orange or red in between. Chinchilla: Slate or black blended with pearl and black tipped guard hairs. Cinnamon: Rust or reddish-brown color. Chocolate: Deep dark brown color. Chocolate agouti: Bands of tan and chocolate with a chestnut tip. Chocolate chinchilla: Chocolate and pearl with chocolate tipped guard hairs. Chocolate steel: Chocolate with tan or silver ticking. Chocolate tortoiseshell: Creamy chocolate with fawn. Copper agouti: Bands of red/orange and dark slate with red at the tip of the hair ticked with black tipped guard hairs. Cream: Pinkish beige to almond color. Frosted pearl: Pearl with black, blue, chocolate or lilac shading. Gray: Three different colors of hair: black, black with tan tip, and black with a tan band, and slate undercolor. Light gray: Agouti with slate blue at the base of the hair, off-white in the middle, and light gray at the tip with black tipped guard hairs. Lilac chinchilla: Lilac and pearl ticked with lilac tipped guard hairs. Lilac steel: Lilac with tan or silver ticking. Lilac tortoiseshell: Lilac and beige. Opal agouti: Slate blue at the base of hair then gold then a blue tip. Orange: Light to bright orange color. Pearl: Light creamy gray color. Pointed white: White with a black, blue, chocolate or lilac colored nose, ears, feet, and tail (like a classic Himalayan cat coloring). Red: Rich brown red color. Sable: Dark grayish brown color. Sable marten: Siamese sable coloring with silver-tipped guard hairs. Sable point: Cream body and sable on the nose, ears, feet and tail. Seal: Dark (almost black) sable color. Self-group: Solid color in black, blue, lilac, blue-eyed white, and ruby-eyed white. Shaded group: Color transitions from dark to light (e.g. frosted pearl, sable, sable point, siamese sable, seal, tortoise). Silver or silver fox: Silver with white or white tipped hairs. Silver Marten: Black, blue, chocolate or lilac color with silver-white markings and silver-tipped guard hairs. Tan Pattern: Marks (not necessarily tan) on the nostrils, eye circles, jowls, inside ears, belly, inside leg, and underside of tail. Groups included marten and otter colorations. Ticking: Solid or tipped guard hairs different than the main coat color interspersed throughout the coat. Tortoise: Orange with black, blue, chocolate or lilac. Tortoiseshell: Orange or dark fawn and black. Tri-colored: White with either black and orange, lavender blue and fawn, chocolate and orange, or gray and fawn colors. Some rabbit colors are rarer than others, such as the silver and lilac colors, while others are often seen in pet stores.